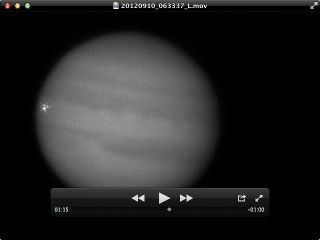 Amateur astronomer George Hall captured this image of an apparent impact on Jupiter while recording video telescope observations of the planet on Sept. 10, 2012, from Dallas Texas. Astronomers and amateur observers are keeping a close eye on Jupiter to see if a surprising impact on the planet Monday (Sept. 10) has left a visible scar, and you can join the search online. Tonight, the online night sky observing website Slooh Space Camera will stream a live telescope view of Jupiter from its Canary Islands Observatory off the west coast of Africa in hopes of spotting any evidence from Monday's space rock impact. On Monday, amateur astronomer Dan Peterson of Racine, Wisc., reported seeing an impact on Jupiter in the form of a bright flash while observing the gas giant planet through a telescope. His sighting was confirmed by another amateur astronomer, George Hall of Dallas, Texas, who recorded a video of the Jupiter impact as it happened. It is unclear if Monday's impact was caused by a wayward asteroid or comet, but follow-up observations may reveal if the Jupiter strike was large enough to leave a visible scar in the planet's upper atmosphere similar to ones seen after impacts in 2009 and 2010. The Slooh Space Camera provides live views of the night sky from telescopes at different sites around the world, allowing members to observe the cosmos remotely. The website's members are eagerly reserving time on Slooh telescopes to take fresh looks at Jupiter after its latest impact, company officials said. "Slooh members have already scheduled the Slooh telescopes to image Jupiter for the remainder of the week in search of any impact scars left in Jupiter’s atmosphere," Slooh engineer Paul Cox said. Editor's note: If you have a photo of Monday's impact on Jupiter, or any other amazing night sky photo that you'd like to share for a possible story or image gallery, please contact managing editor Tariq Malik at tmalik@space.com.